This is my last blog entry for 2010. Although the goal all year was to post every Monday, I missed a few weeks and sometimes I was late. This week, again, I am late but there are reasons. Each week throughout the year I wrote about something that had affected me that week - an event, a persistant thought - but this time, even with Christmas, nothing was uppermost in my mind that was worthy of comment . . . until I received a card from a friend. Inside were two hawk feathers. Sending feathers to me is true to my friend's character. It's something she would not hesitate to do. She told me she found the feathers by the house and thought of me. Why? I don't know. She probably doesn't know. She would not search for a reason; she would just accept the message. All week I had been watching for a sign connecting events of my life. 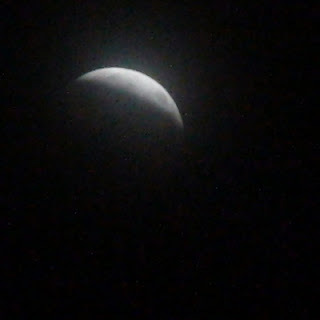 The coinciding of a full moon, a lunar eclipse and winter solstice on December 20th intrigued me (and I stayed up to watch it), but didn't trigger any earth-shattering revelation although I searched for one. Christmas came and went along with a 12-hour power outage. Still nothing. I was waiting for a sign, a feeling, something I had to get down on paper such as had inspired blog posts all year. Nothing . 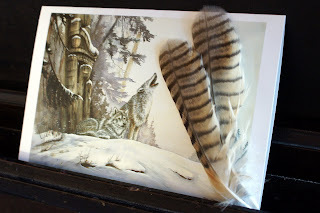 . . until the feathers arrived in the mail. Wolves adorned the front of the card my friend sent to me. That was no accident. She knows I admire the wolf and his way of life, his loyalty most of all. 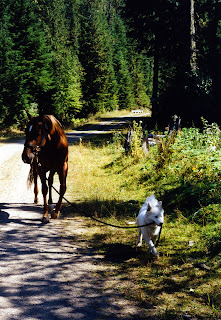 That's why the wolf is the "mascot" for Wildwood Reining Horses. What my friend did not know is that I had chosen a name for the Wimpys Little Step foal arriving in the spring if it is a filly - Feather. Is this a sign? Will it be a filly? Only time will tell. One thing for sure, though, my friend and I had connected . . . through hawk feathers. Hawk feathers are believed to protect, which is why native people tied them at the door of their homes. Feathers are also believed to be the carriers of spiritual messages and were filled with prayer and released to waft heavenward. Faith. So, on the last day of the year, I will spend a quiet day at home with my animals. I will think of my family and friends in other parts of the country. I may contemplate some more on the meaning of the gift of feathers and maybe, just maybe, I will take them outside, whisper a prayer into them and let them go. I'm spending a lot of time with my dog lately. 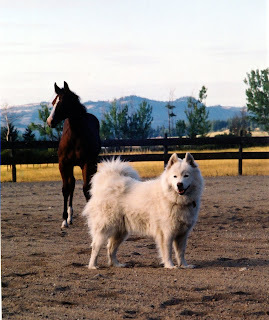 Kirby, my almost-thirteen-year-old Samoyed is failing. 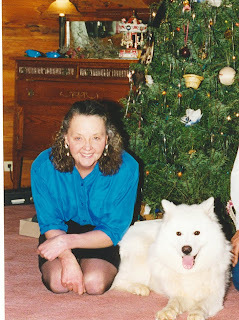 This will be her last Christmas. 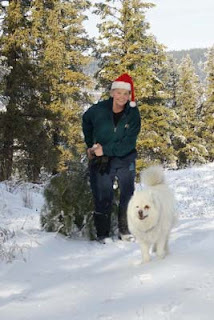 Samoyeds have been my companions for over 40 years. I bought my first one, Tanya, in 1967. At one time I had a kennel and raised puppies but by 1990, I had only one - Mandy. When I lost her a friend gave me a puppy. I picked Kirby up in Calgary in May 1998, at the same time visiting my new granddaughter, Larissa. Here is Kirby with Larissa's sister, Adara. 2010 will be the 12th Christmas Kirby has shared with me. Many of those Christmas mornings, it was just the two of us as it will be this year. The photo below was the first. ...and this one was taken last year. Every spring Kirby has "helped" me foal out my mares. She sleeps in the barn with me, checks the newest addition from the door of the stall and later, herds the baby outside as I lead the mare. None of my mares mind. And she also plays with the babies in the field, although it annoys her when she's digging out moles and the foal pesters her to play. I don't think Kirby will be with me this spring. She certainly won't be herding or playing with the new foals. She probably won't be with the mares and I when they foal either. It won't be the same without her. Kirby lives with me, travels with me, sleeps beside my bed and, most of all, provides unconditional love. 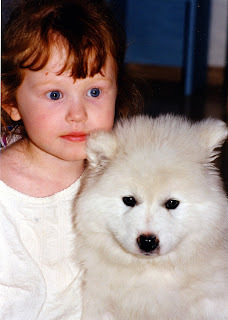 I could write pages about her - years of memories, dozens of pictures recorded in my mind along with those of Tanya, Tatum and Mandy, Samoyeds gone before. If you're wondering why I titled this blog "The Dog Days of Winter", my answer would be, "It just sounded 'catchy'", but there might be more. There is just as much truth to my title as it's more common counterpart, "The Dog Days of Summer". It seems that phrase originated from the fact that Sirius (the dog star, the brightest star of Canus Major) rises and sets at the same time as the sun between July 3 and August 11. Ancient Romans believed earth recieved heat from it. That's not true of course. In January, in our northern latitudes, Sirius can be seen in the southern sky - like far away. Is that why it's so cold in January? My "Dog Days of Winter" consist of spending time with my dog - in winter. I used to be Kirby's favourite season, but now she has to stay in where it's warm. She does not walk well and she is blind. This year she couldn't go with me to get the Christmas tree and I know she misses that. Sometimes she tries to patrol the yard in the morning like she has done every morning for all these years. It's sad to see her insecure and dependent on me because she doesn't want to be. As I drafted the 2010 version of the annual saga of my ongoing activities I questioned the content. How many people really wanted to read yet another list of Sharon's activities? I did want to inform people of what was going on in my life but I didn't want the letter to smack of personal accomplishments that was actually boring to others. Yet I wanted everyone to know that I was enthusiastic about my life. How to do that... That's part of what was lost in the individual handwritten letter - writing only what would be interesting to that person in a tone that was appropriate to that person. The nature of the mega-copied letter I mail out now is, by its definition, more like a newpaper than a letter. To "fix" that flaw and to ease my mind, I left a large blank space on the last page for my own handwritten personal notes. And the letter itself? Well, it took on a new format in my effort to be more interesting. I have tried many themes in the past - the animals reviewing the year, a recipe and, last year, 65 things I was grateful for - but this theme is a first. My Christmas letter this year is written as a play complete with a list of players, settings and dialogue. I know absolutely nothing about writing plays so there was a learning curve but hopefully it is not judged, just enjoyed. I'm just receiving letters and cards myself. In the last mail I picked up a card from a very good friend of mine. Inside was a three page handwritten letter. I read it three times and I'll read it again in the holidays. Well-written, informative, charming and personal. Although I appreciate every Christmas contact of any kind - gifts, cards, photocopied letters or emailed ones - this letter will probably be the highlight of the season. 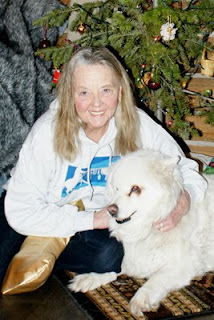 Penny is an extremely busy wife, mother, homemaker, career woman and all around caregiver to her family and animals and she took the time to write. Not type. She took out a pen and paper and wrote three pages to me in her own handwriting. Thank you, my friend. Having just followed the 2010 NRHA Futurity (with Facebook posts by Canadian friends before they left, then en route to Oklahoma City with their horses and live score and web casts on the NRHA web site), one fact I already knew was never more clear - expectations and reality can be a long way apart! Reiners probably already know that. Spectators and fans may not. Most of the horses shown in the Futurity, I had not seen in person. Most of them I had not even heard of. But there were also some I had competed against and several I had read about before that big event - horses that had already won a big futurity somewhere or a horse the breeder was promoting. And I pre-judged the performance of some just because of who was showing him or her. I'm pretty sure others did the same, maybe even owners and riders. Certainly, Shawn Flarida's stellar record commands attention, so of course, expectations were higher for his mounts. After all, he usually qualified all three of his entries for the finals and, for the past few years, he has won all the major events. But Mr. Flarida did not bring one of his entries back to the finals. "One of the other two will win," I thought. Quistator had been advertised as a strong contender all fall. Shine Chic Shine's composite score led the field into the finals. Then there was Duane Latimer, a past Champion, who qualified Whiz N Tag Chex horses, brothers to my own Walking With Wolves. I wanted him to win . . . There was Andrea Fappani, another past Champion, who won the $100,000 Shoot Out and whose wife won the Non Pro Futurity the day before the Open Finals. He was on a roll! Tim McQuay, Craig Schmersal, also fan favourites. But when the last rider completed pattern #5, it was not any one of these favourites that posted the highest score. It was Spooks Gotta Whiz, ridden by Jordan Larson. Did he expect to win that day? I don't know, but the reality is that he did. It was the prettiest, softest run I have seen for a long time, the horse at all time willing and striving to please. Tanya Jenkins, who trained Spooks Gotta Whiz, experienced her own reality. She expected to be showing Spooks Gotta Whiz in Oklahoma City at the NRHA Futurity (I found documentation of this on the internet and she had shown him in other futurities) but the reality is - she did not. It reminds me a little of Zenyatta's race at the Breeders Cup Classic - it didn't play out the way it was supposed to. If it had, a woman could have won the NRHA Futurity for the first time! Expectations and reality - sometimes the same thing, but more often, not. Never more true than in the horse business, especially with three- year-old reining horses.